Interferon regulatory factor (IRF)4 plays a critical role in lymphoid development and the regulation of immune responses. Genetic deletion of IRF4 has been shown to suppress autoimmune disease in several mouse models, but its role in autoimmune diabetes in NOD mice remains unknown. To address the role of IRF4 in the pathogenesis of autoimmune diabetes in NOD mice, we generated IRF4-knockout NOD mice and investigated the impact of the genetic deletion of IRF4 on diabetes, insulitis and insulin autoantibody; the effector function of T cells in vivo and in vitro; and the proportion of dendritic cell subsets. Heterozygous IRF4-deficient NOD mice maintained the number and phenotype of T cells at levels similar to NOD mice. However, diabetes and autoantibody production were completely suppressed in both heterozygous and homozygous IRF4-deficient NOD mice. The level of insulitis was strongly suppressed in both heterozygous and homozygous IRF4-deficient mice, with minimal insulitis observed in heterozygous mice. An adoptive transfer study revealed that IRF4 deficiency conferred disease resistance in a gene-dose-dependent manner in recipient NOD/severe combined immunodeficiency mice. Furthermore, the proportion of migratory dendritic cells in lymph nodes was reduced in heterozygous and homozygous IRF4-deficient NOD mice in an IRF4 dose-dependent manner. These results suggest that the levels of IRF4 in T cells and dendritic cells are important for the pathogenesis of diabetes in NOD mice. Haploinsufficiency of IRF4 halted disease development in NOD mice. Our findings suggest that an IRF4-targeted strategy might be useful for modulating autoimmunity in type 1 diabetes. Type 1 diabetes is an autoimmune disease that results from the autoreactive destruction of insulin-producing beta cells following mononuclear cell infiltration . Studies of NOD mice (a well-characterised animal model of type 1 diabetes) have demonstrated that the beta cell destruction occurs as a consequence of a breakdown in immune regulation, i.e., activation of the innate immune system, and expansion of autoreactive CD4+ T cells, CD8+ T cells and autoantibody-producing B cells [2, 3]. However, the precise mechanisms that control this autoimmune process are still not clearly understood. Interferon regulatory factor (IRF)4 is a transcriptional factor of the IRF family that regulates innate and adaptive immune responses . In contrast to other IRFs, IRF4 is preferentially expressed in lymphocytes and its expression is not inducible by interferons, but rather by antigen receptor-mediated stimulation such as by plant lectins, CD3 or IgM crosslinking . A series of reports have documented that IRF4 plays pleiotropic roles in lymphoid development and its immune response [6, 7]. At the molecular level, studies have suggested that IRF4, together with BATF (basic leucine zipper transcription factor ATF-like) and the activator protein-1 family member JUN, acts as a ‘pioneer transcriptional factor’ that prepares chromatin accessibility for the subsequent lineage-specific transcriptional factor and drives gene expression for the differentiation of effector T cells [8, 9, 10]. It has been documented that IRF4 is necessary for the differentiation of diverse effector CD4+ T cell subsets, including helper T cell (Th) types Th2 [11, 12, 13], Th9  and Th17 [6, 15, 16], follicular Th cells , the sustained effector function of cytotoxic T cells [18, 19, 20], the regulation of effector regulatory T cells (Tregs) , the series of developmental stages of B cells [17, 22, 23, 24, 25, 26] and the development and function of dendritic cells (DCs) [27, 28, 29, 30]. IRF4 is thought to play a crucial role in the pathogenesis of autoimmune diseases, since the genetic deletion of IRF4 has been shown to abrogate several autoimmune diseases in mouse models, including experimental autoimmune encephalomyelitis , experimental colitis  and lupus nephritis . Previous studies have suggested that a lack of IRF4 confers disease resistance due to failure of the specific differentiation of CD4+ T cells, especially Th17 cells, in models of autoimmune diseases including MRL/lpr mice and NOD mice [15, 32, 33, 34]. However, it is still unclear whether one or more specific Th subsets, such as Th17 cells, play a main role in autoimmune pathogenesis in type 1 diabetes, and we and others have reported that a lack of IL-17 does not alter diabetes susceptibility in NOD mice [35, 36]. Studies have indicated that IRF4 is essential for sustaining the differentiation of CD8+ T cells by regulating transcriptional factors that are crucial for effector generation (T-bet and Blimp-1) [18, 19]. Furthermore, the expression of IRF4, which is regulated by antigen–T cell receptor (TCR) affinity, has also been reported to be required for the metabolic function and migratory behaviour of activated CD8+ T cells in a dose-dependent manner . We therefore hypothesised that the dosage of IRF4 expression regulates autoimmune pathogenesis in NOD mice, mediated by autoreactive CD4+ and CD8+ T cells. To this end, we generated heterozygous and homozygous IRF4-deficient NOD mice and evaluated the influence of the genetic modification of IRF4 on the development of autoimmune diabetes, and on the effector function of CD4+ and CD8+ T cells in vivo and in vitro. NOD mice and NOD/severe combined immunodeficiency (SCID) mice were purchased from Clea Japan (Tokyo, Japan). IRF4-deficient mice had been previously generated . These mice were maintained by breeding at the Laboratory Animal Center for Animal Research at Nagasaki University under specific pathogen-free conditions. Only female mice were used in this study. IRF4-deficient mice were backcrossed with NOD mice for 15 successive generations. These mice were selected by a PCR analysis of tail DNA, as previously described [37, 38]. An analysis of the microsatellite markers of the diabetes susceptibility (Idd1-14) loci by PCR of the tail DNA, as previously described , showed that the mice were homozygous for all of the NOD alleles. Genotyping of chromosome 13 confirmed that the NOD/B6/129 polymorphic markers D13Mit80 (8.7 cM from IRF4 loci), D13Mit218 (21.8 cM), D13Mit163 (25.4 cM), D13Mit84 (25.7 cM) and D13Mit61 (Idd14) (41.0 cM) were all derived from the NOD background. Homozygous IRF4-deficient (Irf4 −/−), heterozygous IRF4-deficient (Irf4 +/−) and wild-type (WT) NOD mice were established by intercrossing heterozygotes of the 15th generation. All animal experiments described in this study were approved by the institutional animal experimentation committee and were conducted in accordance with the Guidelines for Animal Experimentation. Mouse blood glucose levels were monitored for spontaneous diabetes using the OneTouch Ultra blood glucose monitoring system (Johnson & Johnson, Tokyo, Japan). Monitoring was conducted weekly when the mice were 12–20 weeks old and then every other week from 20 to 50 weeks of age. Monitoring was terminated when the mice became moribund. Mice with blood glucose levels of more than 13.9 mmol/l for two consecutive measurements were considered diabetic. We performed an ELISA to measure IgG in the serum of mice at 4 weeks of age using the Mouse IgG ELISA Quantitation Set (Bethyl Laboratories, Montgomery, TX, USA). We evaluated the levels of insulin autoantibody (IAA) in serum using a 96-well filtration plate micro IAA assay, as previously described . Pancreatic sections from 18-week-old mice were histologically analysed by staining paraffin-embedded samples with haematoxylin and eosin. A minimum of 30 islets from each mouse were evaluated under a microscope by two different observers. The severity of insulitis was scored as follows: 0, no lymphocytic infiltration; 1, lymphocytic infiltration occupying <25% of the total islet cell area; 2, lymphocytic infiltration occupying 25–50% of the total islet cell area; 3, lymphocytic infiltration occupying 50–75% of the total islet cell area; 4, lymphocytic infiltration occupying >75% of the total islet cell area, or small retracted islets. CD4+CD25− T cells or CD8+ T cells were purified from the spleens of 10- to 12-week-old prediabetic Irf4 −/−, Irf4 +/− and WT NOD mice using magnetic bead cell sorting (Miltenyi Biotech, Auburn, CA, USA). The purity of the CD4+CD25− and CD8+ T cells was at least 92% and 98%, respectively, as confirmed by flow cytometry analysis. Purified CD4+CD25− (1.0 × 107) and CD8+ (0.5 × 107) T cells were combined and i.p. injected into 10-week-old NOD/SCID mice, and the mice were then monitored for blood glucose twice weekly after the adoptive transfer. Single-cell suspensions were prepared from mouse spleens, pancreatic lymph nodes and inguinal lymph nodes. Red blood cells were lysed in ammonium chloride buffer. For surface staining, cells were stained for 20 min with the corresponding fluorescent-labelled or biotin-conjugated antibodies against surface molecules: CD3e (145-2C11), CD4 (GK1.5), CD8 (53-6.7), B220 (RA3-6B2), CD44 (IM7), CD62L (MEL-14), I-Ag7 (I-Ak, 10-3.6) and CD11c (N418). For intracellular IRF4 staining of T cells, splenocytes (SPCs) were stimulated with plate-bound anti-CD3 (BD Biosciences/BD Pharmingen, San Diego, CA, USA) and soluble anti-CD28 (37.51) (2 μg/ml) (eBioscience, San Diego, CA, USA) for 36 h and then stained with phycoerythrin (PE)-conjugated anti-IRF4 (3E4) antibodies. For the intracellular cytokine staining, SPCs were stimulated with 50 ng/ml phorbol 12-myristate 13-acetate (PMA) and 500 ng/ml ionomycin (both from Sigma, St Louis, MO, USA) in the presence of 2 μM monensin for 5 h. Thereafter, the cells were stained with allophycocyanin-conjugated anti-CD4, followed by intracellular staining with PE-Cy7-conjugated anti-IL-17 (eBio17B7) and PerCP-Cy5.5-conjugated anti-IFN-γ (XMG1.2) antibodies (all from eBioscience). For intracellular IRF4 staining of DCs, cells were directly stained without culture. For intracellular staining of granzyme B and perforin, purified CD8+ T cells were activated with plate-bound anti-CD3 and anti-CD28 for 48 h, followed by incubation with recombinant mouse IL-2 (100 U/ml; eBioscience) for 72 h. Before intracellular staining, the activated CD8+ T cells were re-stimulated with PMA and ionomycin in the presence of monensin during the final 5 h. Thereafter, the cells were stained with PE-conjugated anti-granzyme B (16G6) and FITC-conjugated anti-perforin (eBioOMAK-D) antibodies. For intracellular forkhead box protein P3 (FOXP3) staining, cells were stained with FITC-conjugated anti-CD4 and PE-conjugated anti-CD25 (PC61), followed by intracellular FOXP3 staining with PE-Cy5-conjugated anti-FOXP3 (FJK-16s). All cells were analysed on a FACSCanto II flow cytometry system using FACSDiva software (BD Biosciences). Data are expressed as means (SD). Group differences were analysed using Student’s t test. Differences between Kaplan–Meier survival curves were evaluated by the log-rank test, using SPSS II software for Windows (SPSS, Chicago, IL, USA). p values of less than 0.05 were considered significant. We first assessed the expression of IRF4 in CD4+ and CD8+ T cells after TCR stimulation and in DCs without stimulation. T cells and DCs derived from Irf4 −/− NOD mice were used as negative controls. The expression levels of IRF4 in T cells and DCs derived from Irf4 +/− NOD mice were almost half those from WT NOD mice (mean fluorescent intensity [MFI] of CD4+ T cells: 3,221 ± 71 in WT vs 1,806 ± 209 in Irf4 +/−; CD8+ T cells: 2,255 ± 234 in WT vs 1,271 ± 192 in Irf4 +/−; DCs: 1,014 ± 83 in WT vs 720 ± 70 in Irf4 +/−; all p < 0.01) (Fig. 1a–c). Since IRF4 knockout mice have been reported to have lymphadenopathy , we assessed the cell numbers of lymphocyte subsets in SPCs and pancreatic lymph nodes. Flow cytometric analysis revealed that, compared with WT NOD mice of the same age, 12-week-old Irf4 −/− NOD mice had significantly increased numbers of lymphocytes, including CD3+, CD4+ and CD8+ T cells and B cells, but a slightly increased proportion of CD4+ T cells and a decreased proportion of CD8+ T cells (Table 1). In contrast, Irf4 +/− NOD mice showed normal lymphocyte subset distribution and cellularity. We also found that IRF4 deficiency lowered the serum concentrations of IgG in a gene-dose-dependent manner in NOD mice (p < 0.01) (Fig. 1d). To study the role of IRF4 in the pathogenesis of autoimmune diabetes in NOD mice, we compared the incidence of diabetes from 12 to 50 weeks of age, the level of insulitis at 18 weeks and the level of IAA at 12 weeks among female Irf4 −/−, Irf4 +/− and WT NOD mice. We found that Irf4 −/− NOD mice were completely protected from the development of insulitis/diabetes, whereas littermate WT NOD mice showed the normal development of insulitis/diabetes as usually observed in our colony. Importantly, heterozygous IRF4 deficiency completely suppressed the development of diabetes, although minimal insulitis was observed in a small fraction of mice (Fig. 2a,b). IAA expression was absent in both Irf4 +/− and Irf4 −/− NOD mice (Fig. 2c). All of the Irf4 −/− NOD mice, but not the Irf4 +/− mice, became moribund after 40 weeks of age for unknown reasons. This type of early death is also sometimes observed in Irf4 −/− non-NOD mice, and it is unlikely that their deaths are associated with autoimmunity. Type 1 diabetes has been considered to be a T cell-mediated disease. The disease resistance induced by IRF4 deficiency may be due to attenuation of the effector function of T cells in NOD mice. To assess the effector function of IRF4-deficient T cells, we compared the development of adoptively transferred diabetes in recipient NOD/SCID mice that received combined Treg-depleted CD4+CD25− T cells (1.0 × 107) and CD8+ T cells (0.5 × 107) purified from SPCs of prediabetic Irf4 −/−, Irf4 +/− and WT NOD mice. 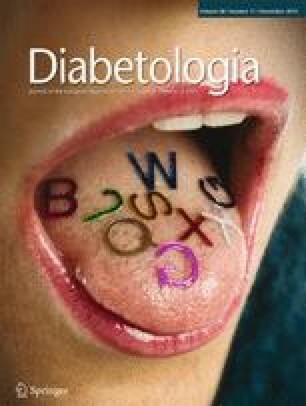 Two-thirds (8/12) of the recipient mice transferred with effector T cells from WT NOD mice rapidly developed diabetes, as expected, while the mice with Irf4 −/− T cells did not develop diabetes until 50 days post-transfer (Fig. 3, p < 0.05). The 25% of mice (3/12) transferred with T cells from Irf4 +/− NOD mice developed diabetes, but with a significant reduction in diabetes incidence compared with mice transferred with WT T cells (Fig. 3, p < 0.05). To investigate the respective effector functions of IRF4-deficient CD4+ and CD8+ T cells, we conducted an adoptive transfer experiment with combined CD4+CD25− and CD8+ T cell subsets alternately derived from Irf4 −/− and WT NOD mice. Diabetes development was suppressed to 11% (1/9) in mice transferred with Irf4 −/− CD4/Irf4 +/+ CD8 subsets compared with mice with both subsets from WT NOD mice (Fig. 3, p < 0.05). No diabetes was observed in mice with Irf4 +/+ CD4/Irf4 −/− CD8 subsets (Fig. 3). Histological analysis revealed that the severity of insulitis was not significantly different between recipient mice with Irf4 −/−CD4/Irf4 +/+ CD8 and those with Irf4 +/+ CD4/Irf4 −/−CD8 subsets (mean insulitis score at 50 days after transfer: 2.02 ± 1.66 in four mice with Irf4 −/−CD4/Irf4 +/+ CD8 vs 2.14 ± 0.77 in three mice with Irf4 +/+ CD4/Irf4 −/−CD8, p = 0.9). These results indicate that IRF4 plays a crucial role in effector functions in not only CD4+ T cells, but also CD8+ T cells in NOD mice. Because IRF4 affects the effector function of CD8+ as well of CD4+ T cells, we evaluated the phenotypes of each T subset. We first determined the expression of surface molecules, identifying memory and naive T cells, CD44 and CD62L, and the Treg population on CD4+ T cells without stimulation. We found that Irf4 −/− NOD mice did not maintain T cell homeostasis, and that the populations of memory and naive T cells were significantly reduced in Irf4 −/− compared with WT NOD mice. However, the populations of memory and naive T cells in Irf4 +/− mice were equivalent to those in WT NOD mice (Fig. 4a–c,g). With regard to Tregs, the percentages of CD4+CD25+FOXP3+ T cells were significantly reduced in Irf4 −/− and Irf4 +/− NOD mice in a gene-dose-dependent manner (9.7 ± 0.8% in WT vs 7.8 ± 0.4% in Irf4 +/− and 4.3 ± 0.5% in Irf4 −/− NOD mice, p < 0.01) (Fig. 4d–f,h). We next evaluated cytokine expression in CD4+ T cells by intracellular staining after stimulation. As previously observed in Irf4 −/− C57BL/6 mice , the percentage of IL-17-producing CD4+ T cells was significantly reduced in stimulated SPCs derived from Irf4 −/− NOD mice, while the percentages of IL-17-positive cells from Irf4 +/− NOD mice were almost equal to those from WT NOD mice. In contrast, the percentages of IFN-γ-producing cells did not significantly differ among the three groups (Fig. 5a–c,g). We also assessed the effector molecules of cytotoxic T cells, granzyme B and perforin, in purified CD8+ T cells after TCR stimulation followed by incubation with IL-2. The production of granzyme B and perforin were severely impaired in Irf4 −/−, but not in Irf4 +/−, CD8+ T cells compared with WT CD8+ T cells (Fig. 5d–f,h). Because IRF4 also plays an important role in the development and function of dendritic subsets, we next evaluated DCs in NOD mice. The proportion of CD4+ DCs in the spleen was reduced in Irf4 −/− compared with WT NOD mice, as has been previously reported in Irf4 −/− non-NOD mice . This reduction was not, however, significant in Irf4 +/− NOD mice (Fig. 6a–f,j). In the lymph nodes, the proportion of migratory (m)DC (MHC-IIhiCD11cint) was reduced in Irf4 −/− compared with WT NOD mice, as has also been reported in Irf4 −/− non-NOD mice [29, 30]. Interestingly, the proportion of mDCs in the lymph nodes of Irf4 +/− NOD mice was intermediate between the other two strains, suggesting that the mDC proportion is dependent on the dose of the Irf4 gene (Fig. 6g–i,k). In this study, we determined the impact of the genetic deletion of IRF4 in NOD mice on the pathogenesis of type 1 diabetes. We found that Irf4 −/− NOD mice were completely protected from spontaneous diabetes, insulitis and autoantibody production, indicating that IRF4 is a crucial transcriptional factor in the development of autoimmune diabetes in NOD mice, as has been reported for other autoimmune diseases [15, 31, 32, 33]. Compared with WT NOD mice, the spleens and lymph nodes of Irf4 −/− NOD mice had phenotypes of lymphadenopathy, including larger size, an increased number of T and B cells and dysregulated naive/memory CD4+ T cell populations. Severe hypogammaglobulinaemia was also observed in Irf4 −/− NOD mice. These phenotypes are consistent with a previous report of Irf4 −/− mice of non-NOD background . Our adoptive transfer study with effector Irf4 −/− T cells showed the complete suppression of diabetes in recipient mice. These findings indicate that total elimination of IRF4 in T and B cells leads to their dysregulated function and diminishment of the intrinsic effector function of T cells that is associated with the development of diabetes in NOD mice. Our findings also revealed that: (1) total elimination of IRF4 abrogated the expression of effector molecules of CD8+ T cells after stimulation; and (2) deletion of IRF4 in CD8+ T cells protected recipient mice from rapid progression of diabetes. These results indicate that the expression of IRF4 is indispensable not only in CD4+ T cells, but also in CD8+ T cells, for the development of insulitis/diabetes in NOD mice. Of note, Irf4 +/– mice showed complete resistance against diabetes development in our study. This is the first report to identify the importance of haploinsufficiency of IRF4 for disease resistance in autoimmune disease. This finding is highly critical from a clinical point of view, as it suggests the importance of subtle differences in IRF4 expression due to gene polymorphisms such as SPI1 for disease development or activity in systemic lupus erythematosus . Similar results have been demonstrated in studies of mitogen-inducible gene 6 protein in streptozotocin-induced diabetes and in our previous study of IL-17 in autoimmune thyroiditis in NOD-H2h4 mice [41, 42]. Currently, IRF4 is considered to be a key component that translates TCR affinity or the strength of TCR signalling into the functions of activated CD8+ T cells, including their differentiation and expansion in a dose-dependent manner [20, 43]. Interestingly, this gene-dose effect was evident in IRF4-haploinsufficient CD8+ T cells. When Irf4 −/− , Irf4 +/− and WT CD8+ T cells were transferred into the same mice and activated in vivo, clonal expansion was most robust in Irf4 +/+ CD8+ T cells, followed by ifr4 +/– and by Irf4 –/– CD8+ T cells . Consistent with these data, our adoptive transfer study showed that IRF4 deficiency in effector T cells conferred disease resistance in recipient mice in a gene-dose-dependent manner. These results suggest that the dosage of IRF4 affects the function of autoreactive CD8+ T cells, or possibly CD4+ T cells, which is associated with diabetes susceptibility in NOD mice. Despite the partial deficit of diabetogenicity in Irf4 +/− effector T cells, Irf4 +/− NOD mice did not develop diabetes, and the mechanisms behind this are not completely explained by defects in T cells. We therefore investigated the phenotype of DCs, since previous reports have demonstrated that lack of IRF4 impairs the development of CD8–CD11b+ DCs in the spleen [27, 28] and reduces the recruitment of mDCs to draining lymph nodes [29, 30]. Interestingly, haploinsufficiency of IRF4 did not affect the development of CD4+ DCs in the spleen, but did reduce the proportion of mDCs in lymph nodes. These results suggest that IRF4 deficiency impairs the migratory function of DCs to draining lymph nodes in a gene-dose-dependent manner, and that this deficit in DC function could play a role in the complete disease resistance of Irf4 +/− NOD mice. Clinical intervention trials conducted with patients with recent-onset type 1 diabetes and using targeted immunotherapy to T and B cells have demonstrated transiently reserved residual insulin productivity [44, 45, 46, 47], although the treatments did not appear to fundamentally alter the overall disease course. Our study of IRF4-deficient NOD mice clarifies the important role of IRF4 in regulating T cells, DCs and possibly other cells in the pathogenesis of autoimmune diabetes, and our results demonstrate that the partial elimination of IRF4 fully suppresses the development of insulitis/diabetes in NOD mice. All of these findings indicate that IRF4 could be an effective therapeutic target in autoimmune diabetes. We thank M. Motomura, Y. Ohyama, M. Tanaka, H. Kawachi and S. Chuganji (Nagasaki University, Nagasaki, Japan) for technical assistance. This study was supported by research grants from the Japan Society for the Promotion of Science (Nos 23791036 and 24591334). The authors declare that there is no duality of interest related to this study. All authors contributed to the conception and design of the study; acquisition, analysis and interpretation of data; and drafting and editing of the manuscript. All of the authors approved the final version of the manuscript. SA, MK and NA had full access to all of the data in the study and take responsibility for the integrity of the data and the accuracy of the data analysis.